(Phys.org) —Researchers at the University of Illinois at Urbana-Champaign have developed a new flow-based method for manipulating and confining single particles in free solution, a process that will help address current challenges faced by nanoscientists and engineers. "This method is a first-of-its-kind tool for manipulation and trapping of small nanoparticles in solution," explained Charles M. Schroeder, an assistant professor in the Department of Chemical and Biomolecular Engineering at Illinois. "Using fluid flow in a microfluidic device means that electrical, magnetic, optical, or acoustic force fields are not necessary." 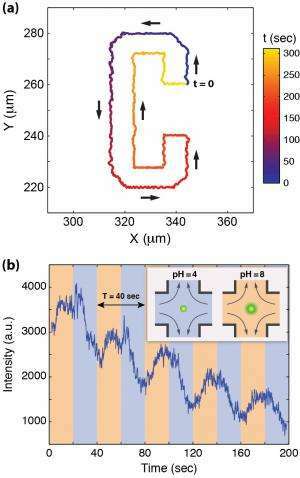 The new method and the research to develop it were published in the May 2013 issue of Nano Letters, in a paper titled "Manipulation and Confinement of Single Particles Using Fluid Flow," authored by Schroeder and postdoctoral researcher Melikhan Tanyeri. Today, fine-scale manipulation of small particles remains a major challenge in the field. Current methods for particle trapping mainly rely on electrokinetic, magnetic, or optical force fields, which may not be compatible with biomolecules or biological systems. Together, Schroeder and Tanyeri developed a "microfluidic trap" capable of 2-D particle manipulation using the sole action of fluid flow. Schroeder and researchers demonstrate several unique features of the microfluidic trap, including 2-D manipulation of particles as small as 500 nanometers in size in water, with a positioning precision of only about 180 nanometers, trapping of particles as small as 100 nanometers, and active control over the solution conditions of a trapped particle. All of this is achieved with a simple PDMS-based microfluidic device without the need for complex instrumentation for optical trapping or electric field generation. 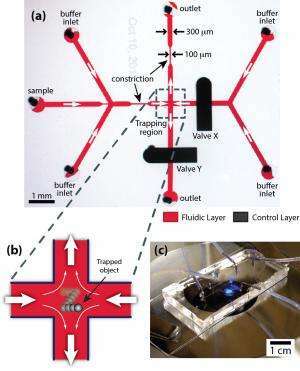 "The microfluidic trap provides a fundamentally new method for the trapping and analysis of single particles or single molecules, complementing existing techniques," Schroeder said. "Our new technology will find pervasive use in interdisciplinary fields such as nanoscience, materials science, complex fluids, soft materials, microbiology, and molecular biology." Schroeder and Tanyeri said they now have the ability to trap a range of particle sizes. "Unlike existing methods such as conventional optical or magnetic traps, the microfluidic trap will allow for trapping of tiny nanoparticles, less than 30 nanometers in free solution," Tanyeri said. With the precise positional control of single nanoparticles in free solution, scientists will be able to explore new technologies, from molecular engineering to bottom-up assembly of nanostructures. "Fluidic-directed assembly may further enhance existing lithographic, self-assembly, and surface patterning approaches for fabricating nanoscale functional materials and devices," Tanyeri said. "This is a key technological advance that will help to address problems in nanoscience and engineering that are inaccessible to current methods, such as directed assembly and patterning of soft materials."